Don't get me wrong, I love a good origin story and with one of my favorite childhood films being the Disney version of Robin Hood I was certainly looking forward to this kind of prequel to the mythology of Robin Hood we have all seen many times before. The trailers gave a look and feel of a rough and classic England mixed with the sweeping camera shots and glimpses of great acting that are usually packaged with a Ridley Scott film. My complaints seem to be the same as many about this latest version of 'Robin Hood'. Though it does look great visually and the acting is top notch, Crowe is simply to old for the role of Robin in an origin story. Had this movie been about the Robin we already know it might make more sense and so gives another reason the sequel to this will be a much better film, granted its given the chance to be made. For a two and a half hour film though it just doesn't seem to have that much going on. Sure we get to see how Robin and Maid Marion fall in love and how Robin and Little John become so close. 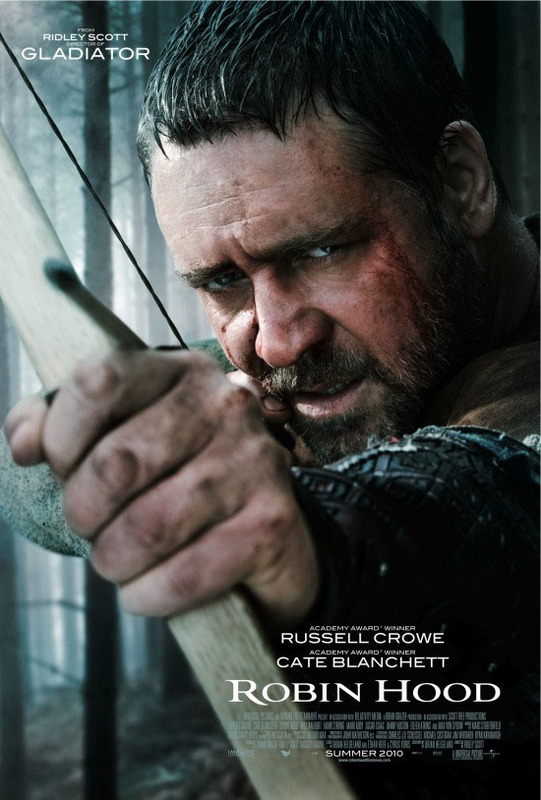 We see the beginnings of his merry men and Richards death that leads to the King John era that has become unanimous with the Robin Hood tale, overall this movie feels more like a history lesson than an interesting story about the beginnings of one of our cultures most beloved folk heroes. It is sad to say all of this because I expected and wanted so much more out of this film. It is consistently slow though and never really gets going until it reaches its final twenty minutes and then abruptly ends as we are just beginning to really get into the story. I hope Mr. Scott and his team make enough money off of this film so that they are granted the chance to make a second movie. It will certainly be more exciting and interesting than this one turned out to be. It is hard to blame Scott or any of the actors though, the real weakness here is the script and so if we are lucky and get to see the second part of this "new" Robin Hood I hope they at least hire a collaborator to work on the script, liven it up a bit. Give it a better pace. This production has everything it needs to become a great take on an iconic character, it just needs that story that will turn it from missed opportunity to making the sum of its parts an opportunity one wants to see over and over again.